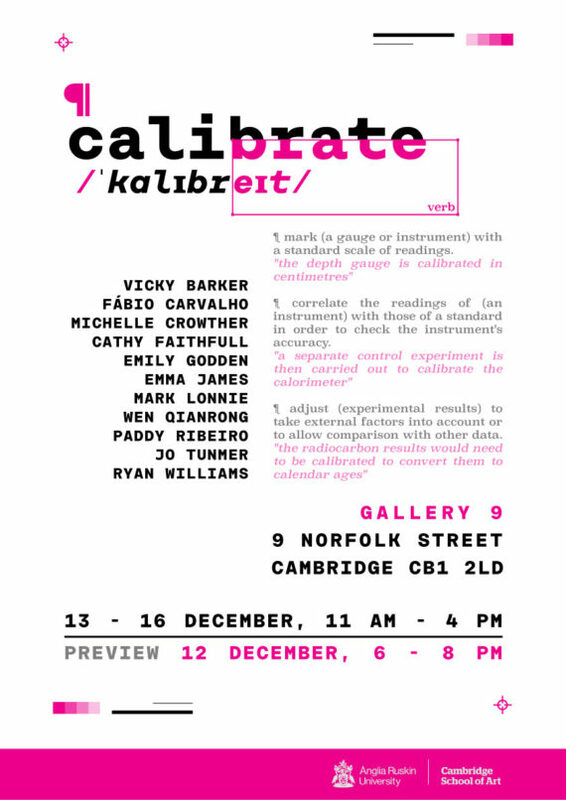 Eleven MA Fine Art and Printmaking students from Cambridge School of Art interim show. Working within a diverse range of practices from performance art to installation and video work, eleven MA students from the Cambridge School of Art, Anglia Ruskin University will be exhibiting together in this interim contemporary art show. exhibition – pieces originally conceived as individually site-specific in line with their current investigation into Site Specific work and Curatorial Practice, will need to be revised, reworked and re-imagined in order to present a seamless and cohesive body of artwork into the white gallery space. Vicky Barker, Fabio Carvalho, Michelle Crowther, Cathy Faithful, Emily Godden, Emma James, Mark Lonnie, Wen Qianrong, Paddy Ribeiro, Jo Tunmer and Ryan Williams.